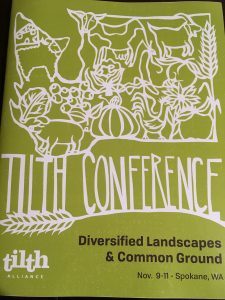 I recently got the chance to attend the 2018 Tilth Conference in Spokane, which was an incredible experience! I have been procrastinating on writing it up because there is so much to say. Over two days I got to meet a ton of small-scale farmers, seed producers, flower heroes, and other industry folks. I went to sessions on everything from liming to using weeds as food! It was such a cool conference with so many great people and speakers. Here are some of the highlights! Okay, the biggest highlight of my weekend was definitely meeting my flower hero, Debra Prinzing, who started the Slow Flower Movement. 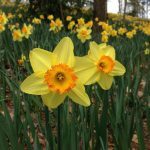 I have written before about why local, slow flowers matter. 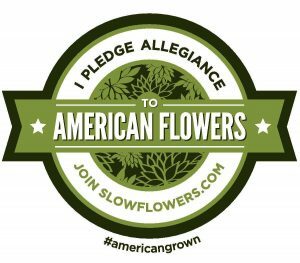 Debra deserves all the credit for bringing more awareness about American-grown flowers and using what is in season. 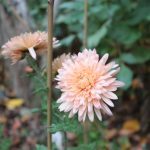 She has inspired a lot of small-scale flower growing in the last decade, and has helped increase demand for locally-grown cut flowers. The panel was awesome because it also featured Beth of Snapdragon Flower Farm in Spokane, and Katie Lynd of the Washington State Department of Agriculture (WSDA). Together, they have been doing consumer research on locally-grown cut flowers, which was really eye-opening. The biggest takeaway was that most people do not know where their flowers come from. However, with a little bit of extra education, people were willing to seek out local flowers next time. Overall, it was a great panel and a wonderful opportunity to meet some of the most inspiring people in floriculture. 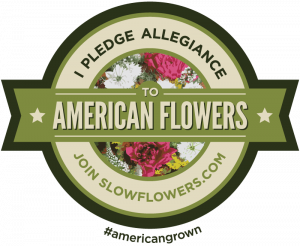 Shortly after the conference, I joined Slow Flowers and now have a listing up on Debra’s site! The second highlight was meeting other farmers, especially women farmers. I went to a panel on Women in Agriculture that featured Anne Schwartz of Blue Heron Farm, Micha Ide of Bright Ide Acres, Beth Robinette of Lazy R Ranch, and Audra Mulkern of the Female Farmer Project. What a superstar panel! It was so inspiring to hear them talk about their farm businesses and building community. I also met Lisa Hasselman of Forest Garden Farm in Vashon, who grows flowers. Mai Nguyen grows heirloom ethnic grains in California to preserve diversity in plants and culture and gave our keynote speech. And finally, I went to a panel on growing for seed from Aaron Varadi of the Organic Farm School, which gave me a whole new appreciation of the seeds we buy so easily! It was so incredible to meet with and talk to other farmers all weekend. 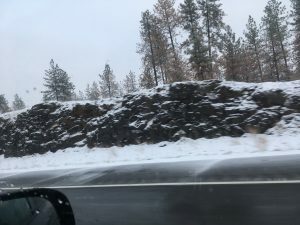 On our way to Spokane, we got the first snow of the year and drove up to a winter wonderland. It made the weekend just a little bit more magical, since we rarely see snow in Seattle. We were also worried about the roads and driving around because of our experiences with snow in Atlanta, including Snow Jam. (Some of our friends had to park their cars and hike home because they literally were trapped for hours.) So, to have beautiful snow and clear roads was totally foreign and delightful! 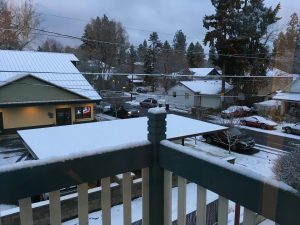 Spokane did a great job of salting the roads and sidewalks and we had zero problems. I will also say, seeing the other side of Washington was really cool. 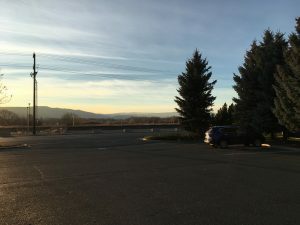 Spokane was a cute town and the landscape is incredible, and so very different from Seattle. I can’t wait to see what the 2019 Tilth Conference has in store!